Rhynchophylline is an alkaloid found in certain Uncaria species (Rubiaceae), notably Uncaria rhynchophylla and Uncaria tomentosa. 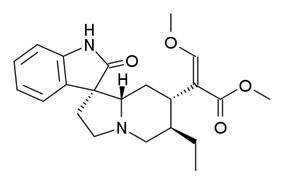 It is a non-competitive NMDA antagonist (IC50 = 43.2 microM) and calcium channel blocker. It also occurs naturally in the leaves of the Mitragyna speciosa (Kratom) tree (also a Rubiaceae), native to Thailand. ^ Shi JS, Yu JX, Chen XP, Xu RX (2003). Alkaloids, Rhynchophylline and Isorhynchophylline"Uncaria"Pharmacological Actions of (pdf). Acta Pharmacologica Sinica 24 (2): 97–101. ^ Mohamed AF, Matsumoto K, Tabata K, Takayama H, Kitajima M, Watanabe H (2000). "Effects of Uncaria tomentosa Total Alkaloid and its Components on Experimental Amnesia in Mice: Elucidation Using the Passive Avoidance Test". Journal of Pharmacy and Pharmacology 52 (12): 1553–1561. ^ Kang TH, Murakami Y, Matsumoto K, Takayama H, Kitajima M, Aimi N, Watanabe H (2002). "Rhynchophylline and Isorhynchophylline Inhibit NMDA Receptors Expressed in Xenopus Oocytes". European Journal of Pharmacology 455 (1): 27–34. ^ Kang TH, Murakami Y, Takayama H, Kitajima M, Aimi N, Watanabe H, Matsumoto K (2004). "Protective Effect of Rhynchophylline and Isorhynchophylline on in vitro Ischemia-Induced Neuronal Damage in the Hippocampus: Putative Neurotransmitter Receptors Involved in their Action". Life Sciences 76 (3): 331–343. ^ Microgram Bulletin (March 2006). "DEA; Special Intelligence Brief - Kratom (Mitragyna speciosa)". DEA Microgram Bulletin.